As most of us know, all of our cultivated bananas are sterile clones and those little black dots in the middle of the fruit are immature seeds which will never develop. Getting a real seed out of a cultivated banana is a really rare event, as we realise immediately when we think about how many bananas we have eaten and how few seeds we have found. 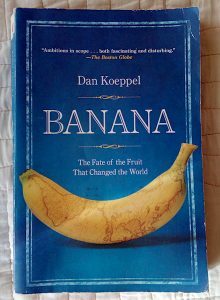 Five years ago I wrote a post celebrating our backyard bananas and lamenting the vulnerability of the commercial crop. Several more posts since then have touched on the dangerous lack of genetic diversity of the endlessly-cloned Cavendish (especially Wild bananas) and a book I picked up in our Balinese guesthouse recently refocused my attention on the issue.